I just got my copy of Private Collections. I'm enjoying each page of this book! Finally! I bought myself a copy. Nice book! A worthy investment that I'd love to share to young and starting Filipino Art collectors. The private collections featured in the book are a melange of audacity and great inspiration. A lot of thought has been put in this book. Great character for a book. I enjoyed it. Quality is far better than most art books. The paintings are arranged that links the collector's life with the substance of the painting. I might be wrong but it is though as it was well thought of. I like it nonetheless. More books in the future? 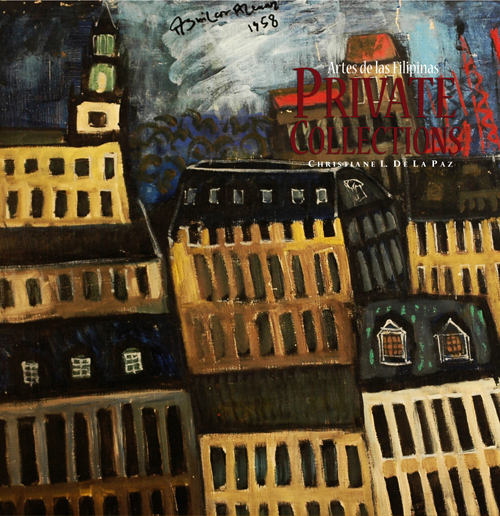 The art collection of Wilmer Hontiveros alone stands out in this book. I want to criticize this book for it's hefty price but when I saw a copy, I became quiet. Now, I understand why. Mr. Hans Sy, you have an art collection that is strong and cohesive. One train of thought for a disciplined man. I admire you and your art collections. I congratulate Eddie Chua for his sterling art collection in this book. This book is head and shoulders above what other art books have done in the past. Very impressive. I have two books of Private Collections with the Alcuaz and Edades cover. They are the only two European looking covers out of the six. The rest is a give away that it is a Filipino art book. I was given this book as a Christmas present. Good job. I enjoy it. I am happy to have been introduced to collecting through my friends who have begun to collect art. This book is wonderful for advanced and beginner collectors as it does not assume the reader has any foreknowledge of Philippine art but it certainly does not bore the reader who does. The paintings in this book are beautiful and I could just imagine the time and effort capturing the real colors and beauty of the artworks. The illustrations also bring to life some paintings that may otherwise seem from another time. This is the only book I know that gives a landscape of the innovative contemporary artists in the Philippines. Even the up and coming new artists were covered in some collections but the consequence of this is that there is always the tendency for these artists to disappear into obscurity in the coming years. Another interesting aspect of this book is that since there are thirty collectors covered, you can judge each one of them on the basis of what they collected even if they have the best explanation of why they collect art. I honestly feel that each art collector was honored here and was given a special treatment in the eyes of the readers to be important and to be appreciated for their contributions in the art circle. I consider this publication very well done and a must have for the modern homes of modern art collectors. Good job! Congratulations! This book presents a balance account of Philippine art, the artists, the issues, the collectors, the critics. Of particular interest to me is the author's introduction. She relied on library research and injected her insights using her interviews with the thirty collectors. The writing and tone was not condescending. It was as if the author wanted to reach to a broader reader -- clear-eyed and plainly spoken. The illustrations covered illustrate the changing tastes of art collectors in a fast-paced time. The book's insights also reveal the positive role of art in modern life. The best book so far about Filipino collectors.... The one to read for knowledge about our new Medicis. Three chapters are devoted to thirty collectors; they are organized into three categories: end, middle and early. I find the logic and arrangement convincing. Each chapter takes on a different layout but when you look at the overall art direction of the book, it is cohesive and is heading towards conceptualism. In this book, I am very much a fan of the collections of Evelyn Dy, George Ty and Hans Sy. A book of this kind must be a long time in the making. It is a good read and impressive debut for a first-time writer. I like the literature review and analysis of essays.